Imagine it is 1918 and you are resting in a comfortable chair with the phonograph playing. Perhaps this trade catalog will give us a glimpse of what that might have been like almost a century ago. 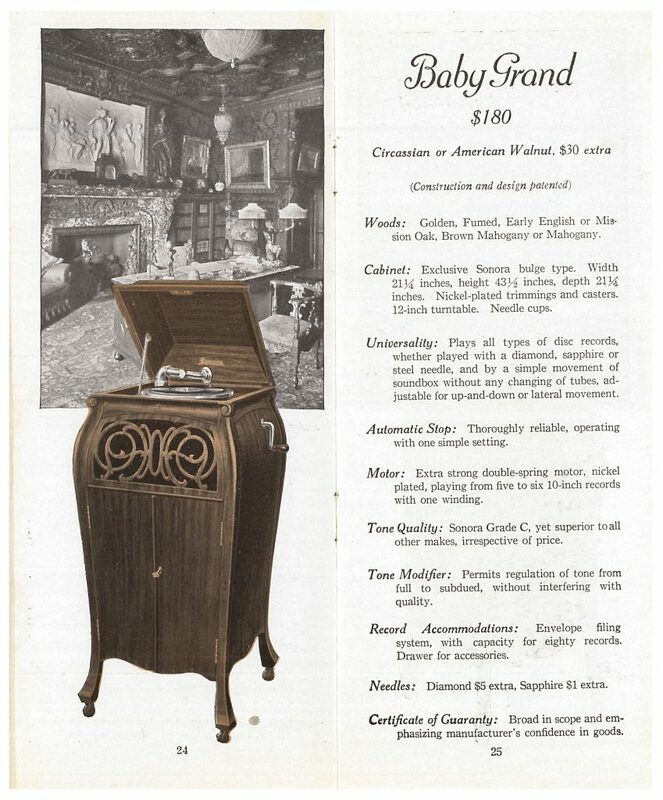 The catalog, titled Sonora: The Highest Class Talking Machine in the World, is from 1918 and is by Sonora Phonograph Corp. A quick flip through it will reveal page after page of phonographs. Above each image of a phonograph is another image of a room in a house where perhaps it was kept. Sonora Phonograph Corp., New York, NY. Sonora: The Highest Class Talking Machine in the World, 1918, front cover showing a phonograph and large porch with chairs and sofa. Sonora Phonograph Corp., New York, NY. Sonora: The Highest Class Talking Machine in the World, 1918, title page. As stated in this catalog, “tone is the essence of a phonograph,” and according to the catalog, the Sonora Phonograph won the highest award for tone quality at the Panama-Pacific International Exposition. The Baby Grand, illustrated below, received a Sonora Grade of C for tone quality. The design of the cabinet included a bulge. Manufactured of wood, the Baby Grand was made of Golden, Fumed, Early English or Mission Oak, Brown Mahogany, or Mahogany. Sonora Phonograph Corp., New York, NY. Sonora: The Highest Class Talking Machine in the World, 1918, pages 24-25, Baby Grand. The illustration below shows features of the Sonora phonograph, including the sound amplifier, automatic stop, and envelope filing system. The envelope filing system was a way to store and organize records. After a record was pulled out of the filing system, the envelope remained in a slightly forward position making it easier to find the proper location when returning the record. The filing system also came with an index book to help locate records easily and efficiently. Sonora Phonograph Corp., New York, NY. 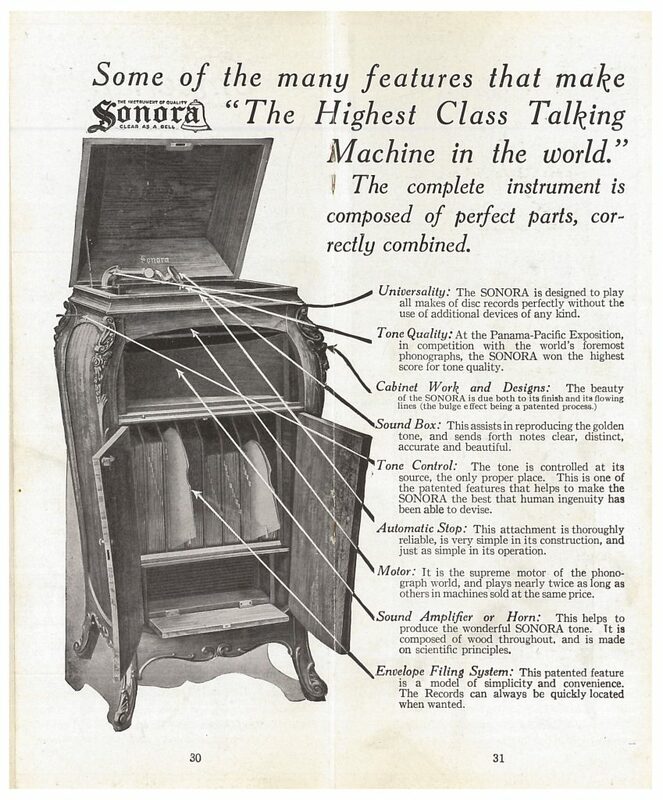 Sonora: The Highest Class Talking Machine in the World, 1918, pages 30-31, features of the Sonora phonograph. 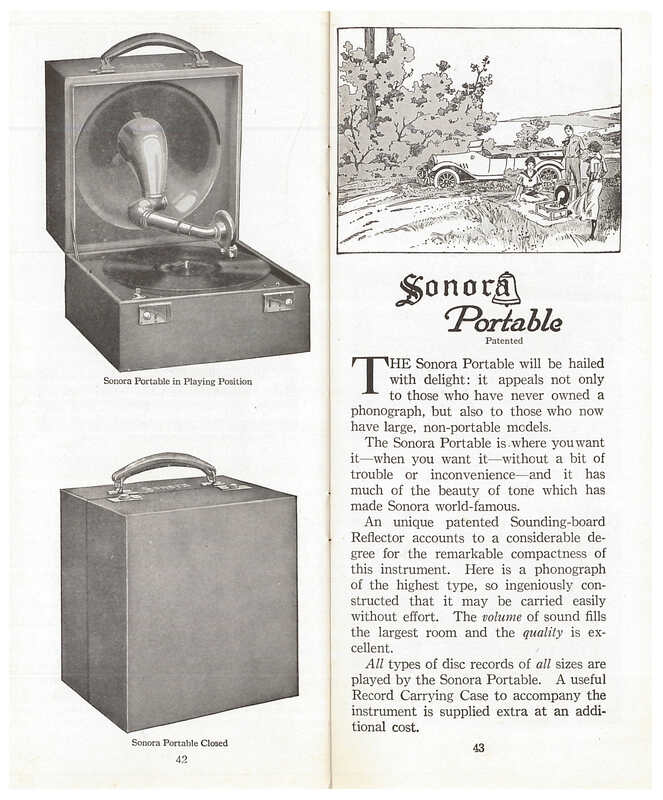 Sonora also made a portable phonograph. Whether it was for a child’s birthday party, a picnic, or a trip to the mountains, the Sonora Portable was easy to take along for the ride. Weighing only fifteen pounds, it measured 10.75 inches long, 10.75 inches wide, and 10.5 inches high. 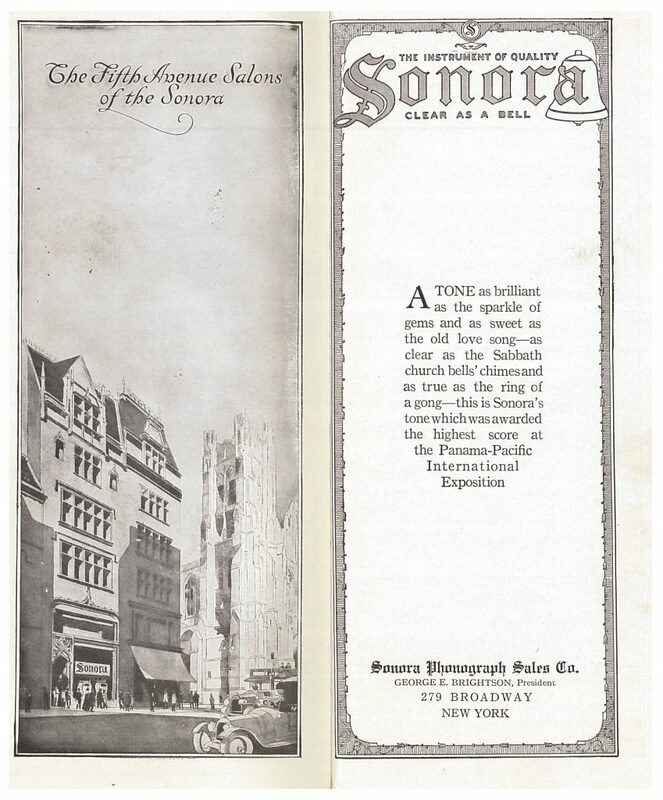 Sonora Phonograph Corp., New York, NY. Sonora: The Highest Class Talking Machine in the World, 1918, pages 42-43, Sonora Portable. Sonora: The Highest Class Talking Machine in the World and other trade catalogs by Sonora Phonograph Corp. are located in the Trade Literature Collection at the National Museum of American History Library. Would you know if Sonora ever made their cabinets out of wicker? I have a Bombe shape wicker phonograph cabinet that I am seeking the maker of.